I am still not used to sweetened rice dishes..I guess it's because I grew up eating them plain or savoury. This looks really nice and I would love to have some! Angie, thank you. I think you would really like it. I made a batch with 1/3 cup sugar, and it was good too and barely sweet, which is what I always prefer. This looks pretty yummy. I'm not a real rice pudding aficianado but this sounds very good! I know, Sully. And I love tapioca, too! Wish I could put you in a boot camp of sorts for picky eaters, where I could reintroduce you to some of these things in their best iterations. I might even have to yell a bit! Thanks, Jeanie. It's kind of different from regular rice pudding. That long slow cooking gives it a caramelized effect--very tasty. I adore rice pudding but confess I'm somewhat daunted by the long cooking time. As for the brotherhood, I was so intrigued by that I looked up their site with a little help from Google Translate. They do indeed sound like a group to be reckoned with! Oh dear me, Jean, this rice pudding looks incredible! I can't believe the length of cooking that it requires, but it sounds heavenly. I must try... I love comfort food, and rice pudding and tapioca fit in that category. Thanks for your recent visits to my blog. I appreciate you and your comments. Thanks, Pauline. No need to be daunted by the cooking time because it's nothing to do with you--it just slowly cooks away while *you* go about your business! Kitty, thank you. It takes a long time, but *you* don't have to do anything--just put it in and take it out! Thanks, Sean. Yes, this is a tasty, rather low-sugar, comfort food dessert combination that I recommend! Jean, I love rice pudding and this looks delicious! Thanks for,sharing! Thanks, Ellen. It is! I made it twice in one week. Pam, thank you. I'm making it again this weekend. I love rice pudding, but I'm not so sure about the skin. Good for you Jean, sticking with all things French.France is an amazing country. Have you and Mr delightful been there? I love rice pudding and this looks yummy! I usually sweeten mine with honey instead of sugar which adds great flavor-may try it with your recipe. I have also baked mine with a handful of dried fruit stirred in, usually craisens, blueberries or cherries. Mrs Shoes, we don't like pudding skin. I scrape it off before scooping out the pudding. The skin just holds in the moisture as the pudding cooks. Thank you, Denise. 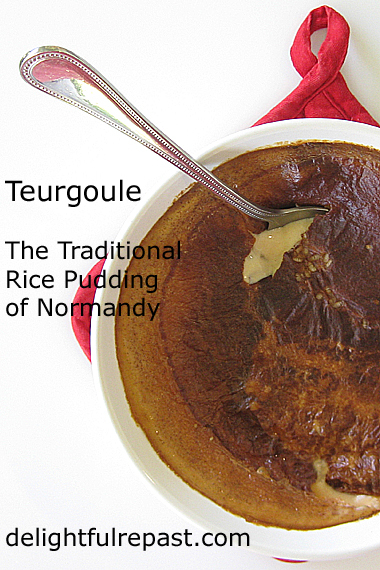 I have occasionally added dried fruits to a rice pudding, but I really prefer the caramelized undertones of the long-cooked Teurgoule unadorned. We are both big fans of rice pudding. And I am even a bigger fan of a recipe that can hang out in the oven for several hours without my attention. This is definitely coming to our table once the temperatures go below 100°! Isn't that wonderful, David, when you can just throw something in the oven and forget about it?! Learning about another country's tradition is interesting.I think I would like that rice pudding!Thanks for sharing the recipe and that embroidery napkin,so cute.Hugs,Jean! Thank you, Maristella. And count on YOU to notice the napkin! I love the linens you've collected. I'm so pleased to see that I was able to introduce you to the joys of the teurgoule. I love a pudding that needs so little effort. As for the estimable gentlemen and ladies (yes, it's not just men) of the confrerie over in Normandy, I like to think that they'd be more than happy that we're making and enjoying their beloved dishes, even if we do tweak them a bit here and there. However, just in case I'm wrong about the confrerie, I've taken to wearing a false beard and answering only to the name of Clotworthy Skeffington for the next few weeks. Well, Phil, I don't think I could carry off a false beard, but perhaps a dark wig and sunglasses. Hmm, what shall I call myself? Perhaps something like Honoria Braithwaite. Thank you for the recipe and for popping in to visit. Thank you, Fabby. I'm sure you have the perfect dishes to serve it in, too, since you're the queen of tablescapes! This looks like the ultimate comfort food, Jean. Yum. Thank you, Amalia. I think so, too. I usually have rice as a side dish, but I'd love to try this rice pudding as a dessert. Thanks for the visit, Jean. Thanks, Margie. It's a real comfort food dessert! Never, Heather? Oh you MUST try *this* one! You just put it in the oven and forget it! Oh my goodness, I can't wait to try this! Definitely pinning. Donna, thank you! I think you'll definitely like it. Oh yum! I love rice pudding!! Thanks for sharing your recipe with SYC Jean. Thank you, Jann. I'm making another batch this morning! 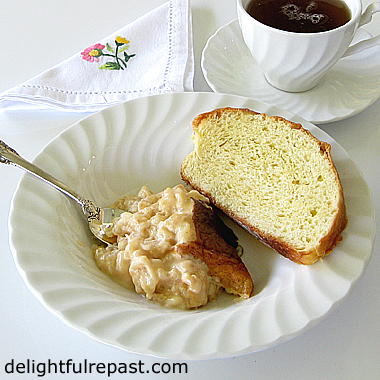 Rice Pudding is one of my favorites, I always find it so comforting. Your recipe looks delicious! Hope you are having a great week and thanks so much for sharing your awesome post with us at Full Plate Thursday! Miz Helen, thank you. I'll be taking another batch of the pudding out of the oven in about half an hour! Love that it requires no stirring, just throw it in the oven and forget about it. I adore rice pudding and tapioca! I consider both comfort food. I have made stovetop and oven baked rice pudding but added raisins and both cinnamon and nutmeg. I also sometimes serve it with a brown sugar sauce over it which I learned from a grandmotherly lady when I was a little girl. I've never tried this one that requires such a long cooking time. It looks wonderful and I love it when you surprise me with a different twist on a recipe. Thanks for sharing, Jean. Sandi, thank you! Those are both lifelong comfort foods for me as well. The thing about this one that bakes so long is that it takes on a more complex flavor, probably from caramelization of the sugars. I just took one out of the oven a little while ago! Judy, you definitely need to make the fallue! And the rice pudding--well, even Mr Delightful (of all the texture issues) likes it. I like it warm, but he likes it when it's cold and very firm. I haven't had rice pudding in years! This is a particularly succulent looking version -- really nice. Thanks! Thanks, John! I hadn't had it in a few years myself. It's the sort of thing I get on a kick with every few years. Marilyn, thanks so much! I'll see you tomorrow morning! Hi, Jean. I'm surprised to see your recipe because last week I watched a French program recorded in Normandy. They cooked this récipe and I liked it. Lucy, try it again! Try THIS one. People's food tastes change, and something you didn't like as a child might just knock you out now! Marisa, thank you. Funny how one can go a lifetime without ever hearing of something, then hear about it multiple times in a short period! I was so interested to learn about Teurgoule, Jean. I had never come across it before, but I know it's a recipe my family will love. Sharing on Twitter. Thank you so much for your support of the Hearth and Soul Link Party! Thank you so much, April. 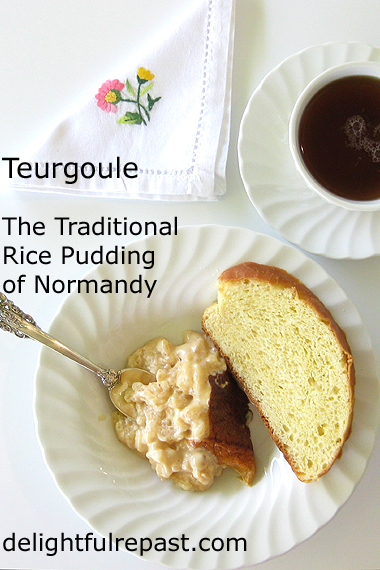 I really enjoyed learning about teurgoule and sharing it with everyone.